Young Ambassadors keep showing its commitment on expressing their actions and words on Expo 2015. Just on March 15, Young Ambassadors participated in the convention “Il Bello e Il Buono” at Seregno, the province of Monza-Brianza, near Milan. The convention involved many experts who talked about nutrition, food, alimentary habit, and the right education to good alimentation, accompanied also with the participation of our Young Ambassadors from Albania and Brazil (Renato Mane and Paloma Gomez) who expressed their opinions about Italian food and alimentation. Five days after, on Thursday, March 20, 2014, they took part in the lesson at Politecnico di Milano, at their Bovisa campus. This time, there were one of the eight important Expo 2015 lessons held by the university of Politecnico di Milano (Polimi) that will be ended in June 2014, with a special visit to the Expo 2015’s site, Rho-Fiera Milano. During the lesson, journalists from Italian National Newspaper, Il Giorno, was there to report about the Expo 2015 lesson. In that moment, they also took opinions and testimonials from some students, participants, and Professors of the lessons. Giving brief opinions was also done by one of the Young Ambassadors from Indonesia, Dewi Wihardja under the representative as one of Young Ambassadors, the association supervised by Eupolis Lombardia (The Research Institute of Lombardy Region, Italy). 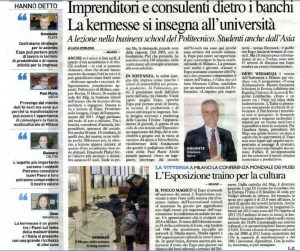 The article about the Polimi’s lesson was published on the Il Giorno newspaper on Saturday, March 22, 2014, written completely in thorough details about the lesson and the testimonials of the participants and Professors.